When Achariya, an ordinary woman from Cambodia got pregnant, she was scared out of her wits. Pregnancy can become a death sentence for women in developing countries, with every year more than half a million mothers dying during pregnancy or child birth. In Cambodia specifically, “maternity-related complications are one of the leading causes of death among women ages 15 to 49”, according to the Population Reference Bureau. Out of every 100,000 women delivering a baby, 265 Cambodian mothers do not make it out of the birth room alive. In comparison, in developed countries like Italy, Australia and Israel, only 4–6 mothers out of 100,000 perish during childbirth. While there are many different reasons for the abundance in maternal mortality, a prominent one is chronic conditions like anemia caused by iron deficiency in food. Dietary iron deficiency affects about 60% of pregnant Cambodian women, and results in premature labor, and hemorrhages during childbirth. There is good evidence that iron can leech out of cast-iron cookware, such tools can be too expensive for the average Cambodian family. But in 2008 Christopher Charles, a student from the University of Guelph had a great idea: he and his team distributed iron discs to women in a Cambodian village, asking them to add it to the pot when making soup or boiling water for rice. The iron was supposed to leech from the ingot and into the food in theory. In practice, the women took the iron nuggets, and immediately used them as doorstops, which did not prove as beneficial to their health. Charles did not let that failure deter him. He realized he needed to find a way to make the women use the iron ingot, and after a conversation with the village elders a solution was found. 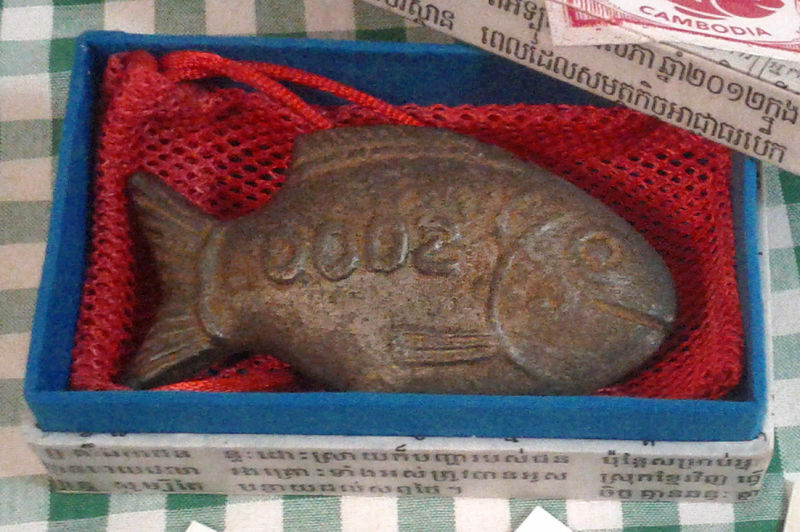 He recast the iron in the form of a smiling fish – a good luck charm in Cambodian culture. The newly-shaped fish enjoyed newfound success as women in the village began putting it in their dishes, and anemia rate in the village decreased by 43% within 12 months. Today, Charles and his company are upscaling operations, and during 2014 alone have supplied more than 11,000 iron fish to families in Cambodia. The Lucky Iron Fish in a gift package. For me, the main lesson from the iron fish experiment is that new technology cannot be measured and analyzed without considering the way in which society and current culture will accept it. While this principle sounds obvious, many entrepreneurs overlook it, and find themselves struggling against societal forces out of their control, instead of adapting their inventions so that they be easily accepted by society. The upper layers are moving forward more rapidly than the lower ones. They are the Uber and Airbnb (commerce layer) that stand in conflict with the Government’s regulations (governance layer). They are the ear extenders (fashion layer) that stand in conflict with the unwritten prohibition to significantly alter one’s body in Western civilization (culture layer). And sometimes they are even revolutionary governmental models used to control the population, as did the communist regimes in USSR which conflict with the very biological nature of the human beings put in control over such countries (governance layer vs. nature layer). As you can see in the following slide (originally from Brand’s lecture at The Interval), the upper layers are not only the faster ones, but they are discontinuous – meaning that they evolve rapidly and jump forward all the time. Unsurprisingly, these layers are where innovations and revolutions occur, and as a result – they get all the attention. The lower layers are the continuous ones. Consider culture, for example. It is impressively (and frustratingly) difficult to bring changes into a cultural item like religion. It takes decades – and sometimes thousands of years – to make lasting changes in religion. Once such changes occur, however, they can remain present for similar vast periods of time. And some would say that religion and Culture are blindingly fast when compared to the Nature layer, which is almost impossible to change in the lifetime of the individual. You can easily argue that the Pace Layer Model is flawed, or missing some parts. Evolutionary psychologists, for example, believe that our psychology is a result of our genetics – and thus would probably put some aspects of Culture, Commerce, Governance and even Fashion at the Nature level. Synthetic biologists would say that today we can play with Nature as we wish, and as a result the Nature level should be jumpstarted to an upper level. It could even be said that companies like Uber (Commerce level) are turning out to have more power than governments (Governance level). Regardless, the model provides us with a good standing point to start with, when we try to think of the present and the future. What does the Pace Layer Model have to do with the smiling luck fish? Everything and nothing. While I don’t know whether Charles has known of the model, a similar solution could’ve been reached by considering the problem in a Pace Layer thinking style. Charles’ problem, in essence, revolved around creating a new Fashion. He had a hard time doing that without resorting to a lower level – the Culture level – and reshaping his idea in ways that would fit the existing culture. 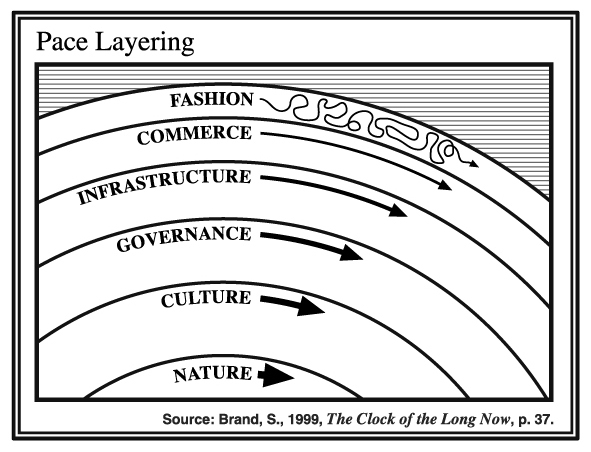 We can use Pace Layer thinking to consider other problems and challenges in modern times. It’s particularly interesting for me to analyze about the Israel-Palestine ongoing conflict, from a layer-based point of view. There is currently a wave of terrorist attacks in Israel, enacted by both Palestinians and Israeli-Arabs from East Jerusalem. I would put this present outbreak at the Fashion level: it’s happening rapidly, it’s contagious (more terrorists are making attempts every day), and it’s drawing all of our attention to it. In short, it’s a crisis which we should ignore when trying to get a better long-term view of the overall problem. What are the other layers we could work with, in regards to the conflict? There is the Commerce layer, representing the trade happening between Israel and the Palestinian Authority. If we want to lessen the frequency of crises like the current one, we should probably find ways to increase trade between the two parties. We could also consider the Infrastructure and Governance layers, thinking about shared cities, buildings or other infrastructures. Last but not least – and probably most importantly – we need to consider the Culture layer. There is no denying that some aspects of the conflict revolve around the religions and other cultural habituations of each side. When a young Israeli-Arab gets up from bed in the morning, feels repressed and decides to murder a Jewish citizen, we need to ask ourselves why the culture around him hadn’t encouraged him to turn to other means of expressing his anger, like writing a column in the paper, or getting into politics. So the culture must change – and we need to find ways to bring forth such a change. Obviously, these preliminary ideas and thoughts are merely starting points for a deeper analysis of the problem, but they serve to highlight the fact that every problem and every conflict can be analyzed in several different layers, none of which should be ignored, and that the best solutions should take into consideration several different layers. The Pace Layer model of thinking can be a powerful tool in the analysis of every challenge, and could be used in many different cases. We’ll probably use it in the future in other articles on this blog, to analyze different situations and crises and examine the deeper layers that exist under the most fashionable and rapid ones. In the meantime, I dare you to use the Pace Layer model to consider problems of your own – whether they’re of the national kind or entrepreneurial in nature – and report in the comments section what you’ve found out.